New England Patriots quarterback Tom Brady stands behind center against the Indianapolis Colts in a 2012 game at Gillette Stadium in Foxborough, Massachusetts. This has not been an enormously surprising NFL season. The four teams remaining in the playoffs — the Seattle Seahawks, New England Patriots, Green Bay Packers and Indianapolis Colts — were well liked by Vegas bettors before the season began. There are a couple of compelling story lines surrounding Peyton Manning and the Denver Broncos. (Is Manning finished? Not necessarily. Is he a playoff choker? Not really.) But betting favorites have won six of eight playoff games so far, and the two upsets (Indianapolis over Denver last week; the Baltimore Ravens over the Pittsburgh Steelers two weeks ago) were fairly ordinary. One of the great things about being a sports fan is that you can take some pleasure either way. Upsets are fun when they happen. But when they don’t, you get to see higher-quality opponents remain in contention. The joy football fans might take from the remainder of this NFL season is tilted toward the latter: We should have two compelling conference championship games this weekend, and they ought to produce a compelling Super Bowl. In fact, the four remaining teams rank Nos. 1 through 4 in FiveThirtyEight’s NFL Elo Ratings. The Colts were ranked No. 7 last week, but their big win over the Broncos was enough to vault them into the fourth position. None of the remaining teams is a slouch. And one has a chance to finish among the best NFL teams of all-time. The Elo ratings have a bird crush on the Seahawks. Only four previous teams (the 2004 and 2007 Patriots, the 1997 Packers and the 1983 Washington Redskins) have entered the conference championship game with a higher Elo rating. So, is this the best conference championship field of all time? No, that’s getting a little carried away. But it’s well above average. Based on the average Elo rating of the four conference championship teams, it ranks seventh among the 45 seasons since the AFL-NFL merger in 1970. We’ve seen a shift away from the parity of the late 1980s and 1990s toward more dominant franchises. 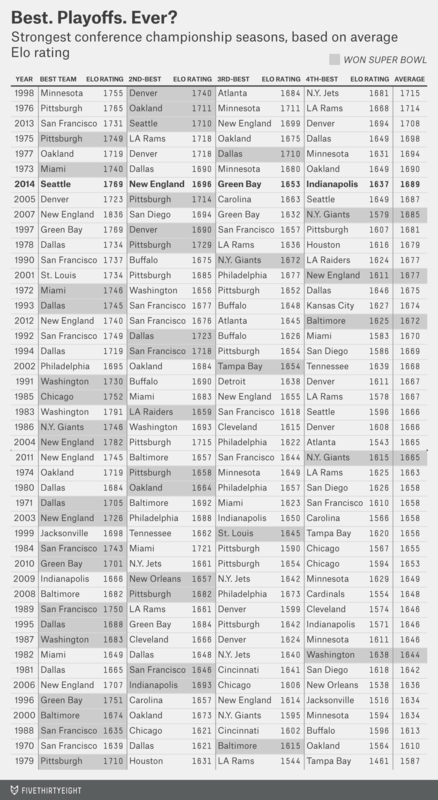 Seattle remains the Elo favorite to win the Super Bowl — as it was at the start of the season. Its chances of a repeat are up to 45 percent — not quite even money, but close — followed by the Patriots at 30 percent and the Packers and Colts at 12 percent each. Elo has Seattle favored by a touchdown over Green Bay, just as prevailing betting lines do. This is a bit surprising given how much Elo likes the Seahawks and how it’s been comparatively down on Green Bay. But Elo does not consider that the Seahawks may have an especially large home-field advantage. In the AFC Championship game, Elo favors the Patriots by five points — consensus betting lines have New England as 6.5-point favorites instead. That’s a marginal difference. And as I’ve said, we wouldn’t recommend placing bets based on Elo ratings, especially given that it’s been unwise historically to wager against Bill Belichick and the Pats.